Sophie Grigson walks you through how to cook a roast turkey that always stays buttery and juicy. To calculate the exact cooking times for your roast turkey use our roast calculator. Preheat the oven to 180C/160C Fan/Gas 4. Check that you have not left the plastic bag of giblets lurking inside the bird. Put the turkey in a large, deep roasting tin. Season generously all over with salt and pepper and massage the seasoning into the skin. Melt the butter in a large saucepan. Fold the muslin in four and lower it into the melted butter, pushing it in so that it soaks up virtually all the butter. Lift out the butter-soaked muslin and lay it over the turkey, making sure that it completely covers the breast and upper thighs. Pour about 300ml/½ pint water into the roasting tin and slide it into the oven. Cook for approximately 3 hours 20 minutes, basting the bird approximately every 30 minutes with the pan juices. Test that the turkey is properly cooked in just the same way as you would a chicken. Pierce the thickest part of the thigh with a skewer. If the juices run clear then the turkey is done. If they are pink, slide it straight back into the oven for a further 15 minutes before testing again and continue to do this until they do run clear. Once it's done, transfer the turkey to a large serving dish, discard the muslin and leave in a warm place to rest for at least half an hour. Cover with foil to stop the meat going cold. While the turkey is cooking, make the bread sauce. Pour the milk into a heavy-based saucepan. Stick the four cloves into the onion, add to the milk and bring very, very slowly up to the boil, so that the milk has plenty of time to absorb the flavours of the onion and the cloves. Remove the onion and cloves and stir enough breadcrumbs into the milk to give a thick sauce. Season to taste with nutmeg and salt. Stir in the butter or cream, adjust the seasoning, then spoon into a warm serving bowl, sprinkle with a little cayenne pepper and place on the table. If making in advance, leave to cool, then cover with cling film and store in the fridge for up to three days. Reheat thoroughly before serving. Sprinkle with the cayenne pepper just before serving. 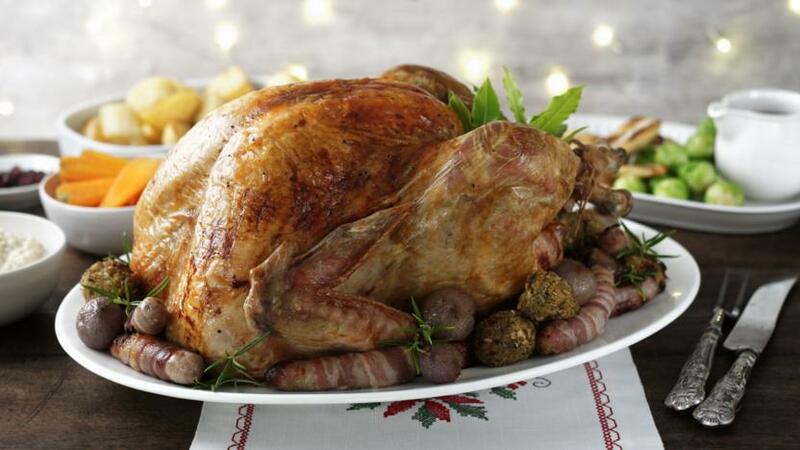 You'll need a large piece of butter muslin (available from good cook shops or fabric shops) for this most classic of Christmas roast turkey recipes.